Arnold Schwarzenegger returns to politics... for Kung Fury, at least. Kevin Feige wants Ryan Coogler back for Black Panther’s inevitable sequel. Plus, Doug Jones is open to return for the Hocus Pocus reboot, Teen Titans Go! To the Movies pokes fun at Justice League and new looks at Legends of Tomorrow and Ash vs Evil Dead. Spoilers, away! THR reports Arnold Schwarzenegger has been cast as the President of the United States. This follows Michael Fassbender’s casting in the sequel. Speaking with Variety, Kevin Feige answered, “I hope so... absolutely”, when asked if director Ryan Coogler would return for a potential sequel. It’s rare to find a project with the right balance of humor, scares and emotions that can make a film entertaining on so many various levels. This project, which at its heart is a love story, builds so many different layers on top of it to create an absolutely horrifying and hilarious thrill ride that keeps you entertained from start to finish. Having been involved as a cinematographer on a number of great films over the years that blended elements of horror and thriller with comedy, I’m excited to direct a project that I think hits all those notes and is hugely entertaining. THR reports Robert Pattinson has joined the cast of Robert Eggers’ The Witch follow-up in an undisclosed role. Speaking with Digital Spy, Doug Jones stated he would “love” to reprise his role as Billy Butcherson in the upcoming Hocus Pocus remake/sequel. There was talk about doing a ’20 years later’ sequel that I would have been involved with. I was actually approached and asked about that. I would love to reprise Billy Butcherson. It’s not off the table. The news article that I read about this TV movie sounds like… I’m not sure if it’s a reboot or if it is that ’20 years later’ sequel. It was grey about what the storyline was. So I’m just going to keep my knees bent and be ready in case they call. The latest poster for the film takes aim at Justice League. Entertainment Weekly reports Julie Plec will direct the pilot episode of the CW’s Roswell reboot. Wally West boards the Waverider in the latest trailer for the back half of season three. Finally, Ash meets his estranged daughter, Brandy, in the latest trailer for season three. Banner art by Jim Cooke. 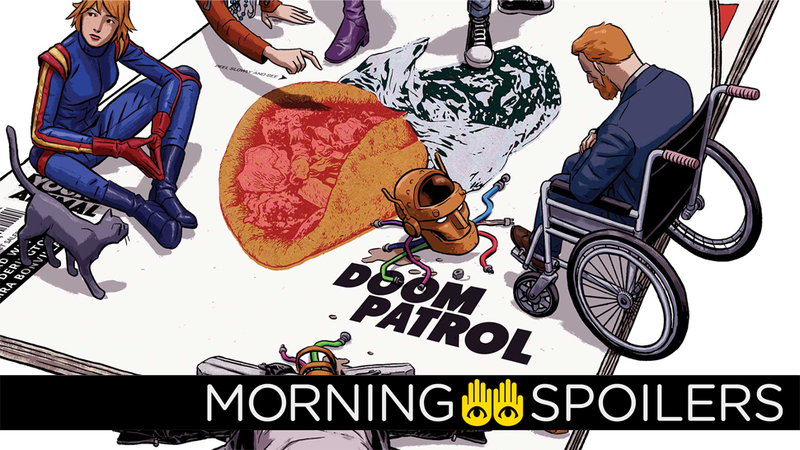 Doom Patrol #1 Cover Art by Nick Derington.